For a country as abundantly rich in ingredients and natural resources as Sri Lanka, its cuisine has yet to reach the dizzying heights of its northern neighbours. While this is now slowly but surely changing for the better, a large reason for that is the work of Dharshan Munidasa who, along with celebrity collaborator Jacqueline Fernandez, opened up Kaema Sutra back in 2014. The fine dining restaurant serving up fresh takes on many classic Sri Lankan dishes, as well as plating up numerous old school favourites, has gone from strength to strength in the years since and its latest venture is its most bold yet. Shifting from its original premises at the Arcade Independence Square, Kaema Sutra has now taken up residence at the newest member of Colombo’s burgeoning skyline, Shangri-La Hotel, Colombo. Located on the fourth floor, the restaurant offers both outdoor and indoor seating, while overlooking the Indian Ocean. With it also offering front row viewing of the soon-to-be-completed Port City through large glass panel windows, the restaurant is aiming to be the ideal haunt for a late evening drink, bite, and possibly even a glorious sunset thrown into the mix. The restaurant itself is rather spacious, seating roughly 150 the entire dining area is located around a bar which takes centre stage. Amply stocked, and thematically decorated with wood-carved elephants, the bar is definitely positioned at being the focal point of any evening, while the three large screen TVs hung on its back wall ensure that patrons can be keep abreast of their sport of choice. An entire wall meanwhile is adorned top to bottom in traditional Sri Lankan masks – a particularly nice touch – which along with wooden tables and chairs, complete a cohesive Lankan theme. The menu highlights at the new Kaema Sutra include an innovative selection of Sri Lankan tapas such as the Porksicle, a slow-cooked pork spare rib wrapped in roti, and Manioc Floss, with strings of manioc root fried and sprinkled with chilli salt. Chef Dharshan’s traditional crab curry will take centre-stage, whilst seafood lovers will also enjoy the prawn clay pot curry with its creamy gravy. The sound of rhythmic metallic clangs churn out the island’s favourite street food, Kottu, as Kaema Sutra offers its own unique spin on this local favourite, with multiple combinations to suit any palate. The beloved lamprais with many cultural influences woven together by the Dutch colonisers makes its appearance as well, with flavourful rice and six delicious curries wrapped in a banana leaf and baked to order – a dish that was painstakingly perfected by Chef Dharshan. Chef Dharshan, who is also behind the popular Japanese restaurant Nihonbashi, has also brought in a few of his Japanese influences into some of the dishes. Famous already for rejuvenating the traditional Lankan hopper – Kaema Sutra is the home of the nine-inch hopper – he has taken innovation a step further with the new Black Hopper. “The Black Hopper is the hopper with squid ink,” he states simply, while drawing attention to other unique takes on traditional staples such as the Scotch Egg Tuna Cutlet the “size of a cricket ball,” or the Godamba Roti Chips (““We accidentally dropped some roti in the fryer”), or the Roti Pizza. 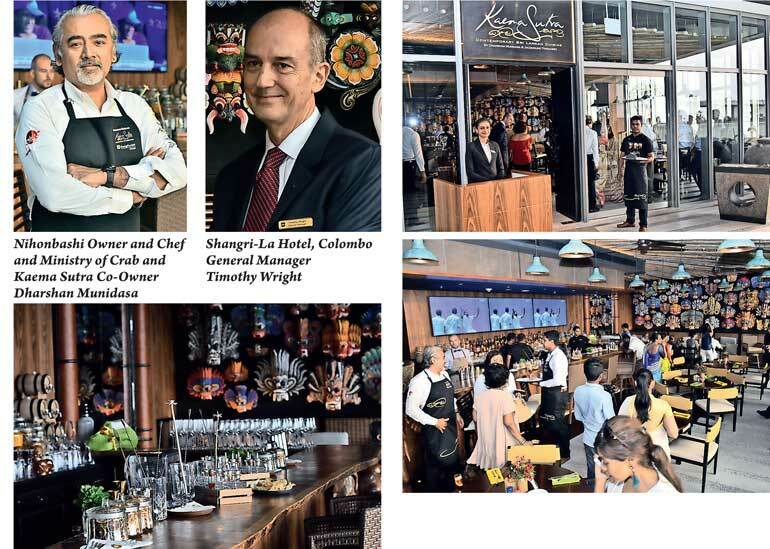 While Kaema Sutra has now firmly established itself as a go-to spot for quality Sri Lankan cuisine, the move by Shangri-La to host them – an external franchise – as an in-house restaurant is a first for a five-star hotel in the country. “We’re obviously new to Sri Lanka and therefore it made sense that we partnered with the most famous and most acclaimed restaurateur here in Sri Lanka,” says Timothy Wright, Vice President & General Manager of Shangri-La Hotel, Colombo. 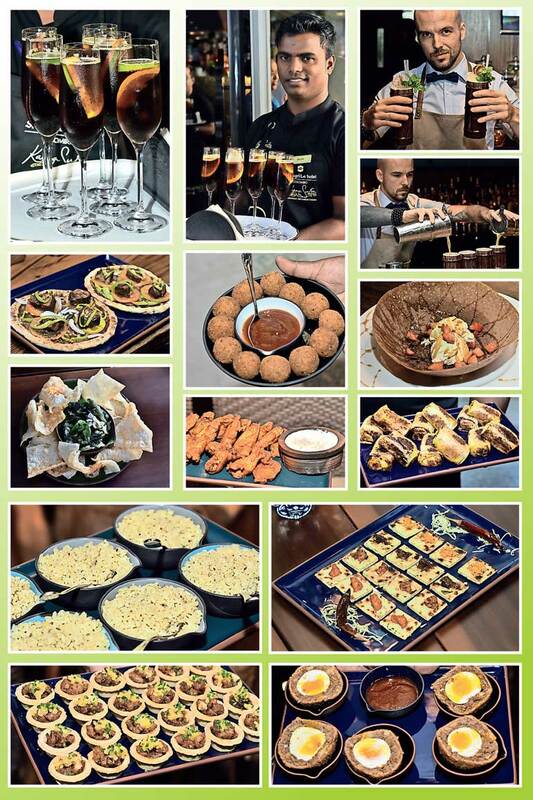 “In our minds we wanted to open a Sri Lankan restaurant. I think if Sri Lanka, as a newcomer to Sri Lanka, had tried to go on its own we would have been criticised. And that’s where the thought arose to reach out to somebody like Dharshan where we said we need some help, we need someone who has the expertise, the understanding, to help us. Kaema Sutra is part of six restaurants and bars at Shangri-La, Colombo and is open daily for dinner from 7 p.m. to 10:30 p.m. The bar is open from 5 p.m. to midnight from Sunday to Thursday, and 5 p.m. to 2 a.m. on Friday and Saturday. For more information and reservations, telephone (94) 11 788 8288, e-mail restaurants.slcb@shangri-la.com or visit www.shangri-la.com/colombo.